His life has spanned two continents and thousands of miles, and if ever a horse could look back upon his history and have a hearty laugh at how it’s all turned out, that horse would be Lough Colga. Owned by Wendy Collins Gutfarb for the majority of his 28 years, Lough Colga is a regally bred Thoroughbred, born in Ireland in 1985. His lineage could not be more stellar. His sire was Lomond, a son of the great Northern Dancer and the spectacular broodmare My Charmer, whose most famous foal was the 1977 Triple Crown winner Seattle Slew. Lomond was foaled in Kentucky in 1980 and his breeders were Warner Jones, William Farish III and William Kilroy: the movers and shakers in those heady days of Thoroughbred trading that lasted from the mid-1970s through the 1980s. Lomond never made it to the auction ring. The bay colt was sold as a weanling to the Englishman Robert Sangster for a cool $1.5 million. Sangster was a millionaire many times over who left an indelible mark in the annals of racing: his horses won 27 European Classics and 100 Group One races. Lomond was sent to the barn of the famous trainer Vincent O’Brien, and as a 3-year-old won the prestigious 2000 Guineas Stake at Newmarket. That was the highlight of his seven-race career, and he was retired to stud following his 3-year-old campaign. One of the mares he was bred to in his first season was Chemise (dam of the stakeswinning turf runner Erins Isle). It was this mating that produced Lough Colga. The chestnut colt was named for a lake in County Sligo, Ireland. He was bred by a group of investors (Bengazi and Ron Con Ltd.) and perhaps one of them had vacationed on the lovely shores of the lake, which is how they came up with the name. Where Lough Colga received his early training is a mystery, but he did run four times in Ireland, although he never finished in the top three. 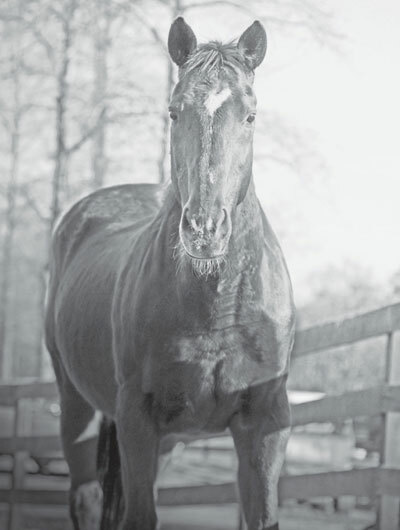 In 1990 he made his way to the United States and was sold at an auction for steeplechase horses in Fair Hill, Maryland. He was purchased by the trainer Doug Worrall for the client Charles Lea. His first American race, and his steeplechasing debut, was at Saratoga on July 29, where he finished fifth. Two months later, he ran at the Fair Hill races, finishing sixth. He was given the rest of the year off, and most of the next year as well. In fact he didn’t appear in the entries again until the Fair Hill races in September of 1991. Lough Colga did not run well at Fair Hill (the chart of the race said he “did not finish”), but three weeks later he appeared at the Foxfield races in Charlottesville, Virginia, where he came in fifth. That was to be Lough Colga’s final race. It was a less than stellar career. It was while he was in the Worrall’s care that he picked up the barn name Charlie (after his owner Charles Lea) and although it certainly isn’t as colorful as Lough Colga, it is much easier to say. Fortunately for Charlie, Wendy happened to be the Worrall’s nextdoor neighbor in Glyndon, Maryland. During the summer, she often rode whichever steeplechase or timber horse was getting a break. Wendy says that it has been her good fortune to have most of her horses simply find their way into her life, usually through friends. Charlie was no exception. Wendy, who had spent six years in Maryland, was moving back home to Massachusetts at about the same time that Charlie was retired from racing. The Worralls were looking for a good home for him, and everything fit together. It wasn’t long before he was on his way to New England and the next chapter in his life. Wendy was a member of the Norfolk Hunt in Massachusetts when she got Charlie, and she also hunted with Myopia, north of Boston. She remembers that Charlie was very green when she got him, but as a lifelong horsewoman she understood that it made no sense to rush him into his new life, and so the pair took their time getting to know one another. When Charlie got into the rhythm of hunting he embraced the sport and Wendy rode him first flight, often leading the field, as well as whipping-in for several seasons. One year he was even the huntsman’s horse. Although Charlie suffered from kissing spines, he was never unsound a day in his life, which Wendy attributes to plenty of stretching before a ride and always having a good saddle pad and a well-fitted saddle. Another one of his quirky habits was rolling as soon as he was untacked. “I think that in Ireland the racehorses have a sandy area where they roll after their morning exercise. Charlie must have remembered that from his early days because the minute his saddle came off his knees started to buckle – he knew what he wanted to do,” says Wendy. Charlie is spending his twilight years boarded at Dawn Sposato’s Hollywood Farm in Aiken. His paddock mate is a 30-year-old retired show horse named Wilbur who was feeling every bit his age before he met Charlie. Things have changed now. Wendy became a winter resident of Aiken a few years ago, moving all of her horses here as well. Certainly they must thank her for getting them away from the New England winters. Charlie, whose life began in the verdant fields of Ireland, is living out his days in the pine-scented air of Aiken. He probably prefers not to recall his steeplechasing career, but instead runs with Wilbur in their large paddock, pretending to be following the hounds in full cry on a great run.